Being an owner of two busy hair salons with twenty five employees has kept me focused on business survival. You might say that my life was not well rounded. Yumi came into my life and demanded that I create some playtime with her. We enjoyed spending time in the nature, went to agility training, and built relationships with owners and their pets. I carved out the time from my busy schedule to spend time with her. Dogs have an amazing ability to live in the moment and appreciate life in a way that we humans seem to struggle with. Named in honor of my beloved late Jack Russell Terrier, Yumi, it is my hope that Yumi’s Life Lessons, will help inspire you to live your best life. 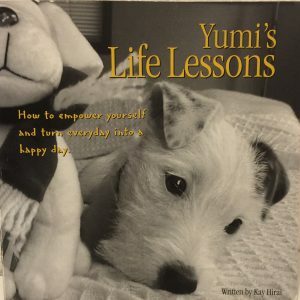 Just as I did with the first edition of Yumi’s Life Lessons, I will be donating 15% from the sale of each book to a selected group of worthwhile animal welfare organizations. Click here to link to a post that includes a short excerpt from Chapter 7 of Yumi’s Life Lessons. "Through this gorgeous little book, Kay’s dog Yumi inspires us all. I suspect that the life lessons Kay shares in it were not only learned from her charming Jack Russell terrier, but also from her years as a successful and innovative business leader. A great gift for family, friends and acquaintances."